On An Overgrown Path: How enduring is your music? How enduring is your music? On a mildly related topic which would have fit better a few topics back, I've never really come to grips with what "world music" is. Specifically, why are Ravi Shankar and Ali Akbar Khan (to mention a personal favourite) often mentioned as world music? Surely they are classical music (or art music) as much as is Schoenberg. Sometimes I think that world music is anything that the writer thinks is more lasting than "popular music" but which doesn't fit within the boundaries of western art music or jazz. 'A classic is a book that remains in print'. The test as to whether a piece of music (of any category) remains in performance (live or recorded) is a telling one. 'Enduring music' is not the same as good music. A lot of bad music remains in performance, and, conversely, some very good music is rarely performed. But, as the search for the musical viagra that will rejuvenate the classical format continues, there are some interesting lessons to be learnt from 'enduring music'. On the left is the great Tamil violinist Lakshminarayanan Shankar, usually known as L. Shankar, or just plain Shankar. He has worked with many great names including Frank Zappa, Eric Clapton, Charly García, Van Morrison and Yoko Ono. Shankar's extraordinary and essential 1981 CD Who's To Know (subtitled Indian Classical Music) for ECM used a custom made 10-string double violin with an equivalent range of string bass to conventional violin. 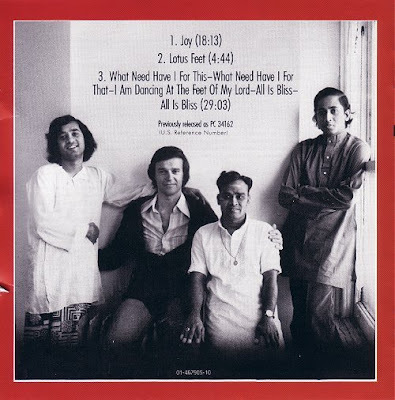 While studying at Wesleyan University in 1975 Shankar met John McLaughlin (next to Shankar in photo above) to form the pioneering but short-lived acoustic East-meets-West band Shakti. It would take several posts to do justice to the work of John McLaughlin. He played on four of Miles Davis' albums, was a session musician with the Rolling Stones, and from Shakti McLaughlin went on to form the influential Mahavishnu Orchestra, which deserves at least a post to itself. 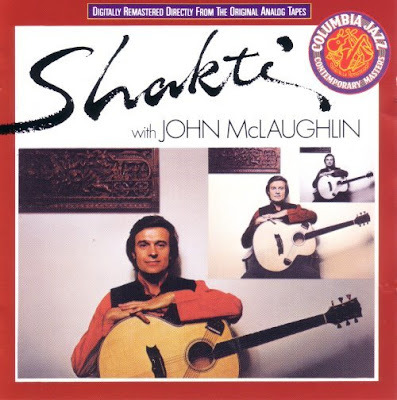 But it is another John McLaughlin project that I want to follow in this 'enduring music' path. In 1981, the then director of the Los Angeles Philharmonic Orchestra Ernest Fleischman asked John McLaughlin to play Rodrigo's Concerto de Aranjuez with the orchestra. The guitarist jokingly agreed on the condition that the orchestra commissioned a concerto from him, and so his concerto for guitar and orchestra 'The Mediterranean' was born. The concerto was premiered in LA in 1984 and was recorded by McLaughlin with the London Symphony Orchestra and Michael Tilson Thomas in 1990 for CBS. Yes, the concerto is a derivative potpourri linked to Rodrigo's masterpiece by more than the Ernest Fleischman anectdote. But that is not the point of my post. Almost twenty years after its first release John McLaughlin's concerto remains in the catalogue in its original release format. Surely there must be a lesson in that? More 'enduring music' beyond categorisation here and here. Comment on Schoenberg and stomach cramps:Scott: I think "World Music" has just become the fashionable term of choice for some to refer to for any non-western music (as if the "West" itself were not part of the "World"!). Again, this seems to posit some separation of the "West" from the "World," as if "Westerners" were mere interlopers not truly at home anywhere. Thus, the term "indigenous" is itself politically loaded; everyone is "indigenous" to somewhere, but the term is typically used only to refer to non-Westerners, particuarly to favored or fashionable minority or Third World cultures.